In constructing "The Best American Book of the 20th Century," artist cooperative Societe Realiste replaces the proper nouns with pronouns. This slightly enhances the original text and enables a selected overview of the history of Best American Fiction in one condensed, ambitious novel.Design agency Project Projects translated these ambitions in the publication's graphics, in close collaboration with the editorial team. Curator Niels van Tomme served as scenographic advisor, Onomatopee director Freek Lomme facilitated final editing and production: exhibition space and publisher Onomatopee provides an institutional framework for the presentation and distribution of this project, making "The Best American Book of the 20th Century" its 100th project issue (OMP100). 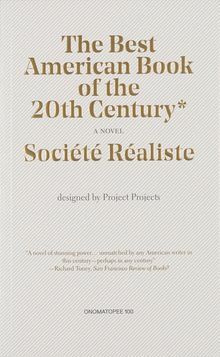 * The 20th-Century American Bestsellers Database consists of work done by undergraduate and graduate students at the University of Virginia, the University of Illinois, Catholic University, and Brandeis University, from 1998 to the present, using the rankings from Bowker's Annual/Publisher's Weekly. Paperback, 5 x 8 in. / 112 pgs.